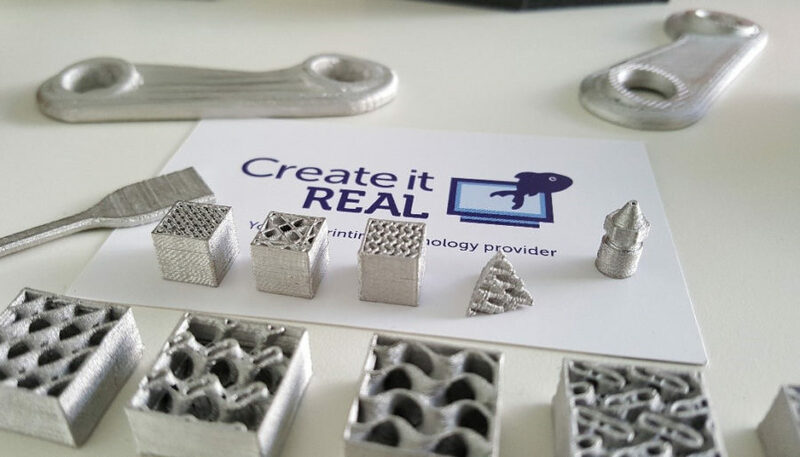 At Create it REAL, we work on several projects and technologies to provide our customers with state of the art solutions for their 3D printing needs: high speed 3d printing, IP (intellectual property) right protections and many other new features to be announced soon. But the Metal FDM printing is probably the most exciting one as we believe it will disrupt our young industry again. Democratizing the creation of ready-to-use metallic parts with standard desktop 3D printers will speed up prototyping, foster creativity and dramatically increase productivity in many fields/industries. FDM 3d printed metal parts will need a post processing procedure called de-binding and sintering. However, this is far from the expensive €200K type of printers available now which require a highly qualified professionals to run. Using a standard desktop 3D printer and provided you are using the right software, metal FDM printing is now available to the masses. During the sintering* process the part will shrink which can be compensated in the slicer. The heat will also cause some geometries to collapse upon themselves which means more care needs to be taken when designing parts. Organic infills**, like the gyroids limit this issue while a standard honeycomb infill will fail the print at the same density. In REALvision, our slicer optimized for high-speed printing, we support minimal surface infill structures ideal for metal printing: 3D Gyroid (Lattice/Skeleton), Double Gyroid, 3D Isomax, 3D Diamond. The benefit of these geometries is that they optimize the weight to strength ratio of the object and save on material use and print time. This is the approach used by large companies in the automotive or aerospace industries to reduce the weight of a part while maintaining its strength under heavy stress. The gyroid for example is a minimal surface with no straight lines. It allows to even out the mechanical stress in all directions in the object. The gyroid lattice slice is made of walls perfectly connected. The MIT found out last year that a plastic gyroid with thin walls could actually create stronger structures than the same structure with thick walls. When 3D printing metal, one key issue is speed. The shorter the print time, the better, as the material will be more homogenous. The less temperature difference there is between the layers from the beginning until the end of the print, the better the properties of the part will be. The layers need to stick to each other as much as possible (layer adhesion). This is another benefit of the Create it REAL platform to offer up to 5 times faster print speed than traditional FDM machines. If you are a 3D printer manufacturer interested in boosting your sales thanks to our technology, please contact us on [email protected] and follow us on Linkedin, Facebook, Twitter, Instagram. (*) Sintering is the process of compacting and forming a solid mass of material by heat or pressure without melting it to the point of liquefaction. (**) The infill is the printed structure inside the object to give it strength and allow to print top layers while avoiding filling completely the object. The shape of the infill is critical to create the proper support inside the object.